Is Bigger Really Better in AV Displays? Digital signage displays today transmit high-resolution content in incredibly realistic fashion, with rich textures and eye-catching colors in truly larger-than-life detail and scope. While signage technology marches forward with bigger and bigger displays, knowing the pros and cons of display types and sizes before specifying can save you and your customer headaches across the life of the installation. Avoiding the pitfalls can also turn new clients into lasting business relationships. Technology advancements in the digital signage market are currently outpacing adoption of new designs. Direct-view LED displays are steadily gaining in popularity thanks to flexibility in screen sizes and shapes that make them attractive for clients looking for custom solutions. However, highly scalable and typically front-serviceable LCD displays still make up the core of the video-wall market. As an integrator, your objective will always be to specify the best display for the space. As displays increase in size and complexity, deployment and service require more forethought. Working with large screens, for example, could require a lift and several techs that disrupt your client’s business. Before deploying a 70-inch or larger LCD screen—whether stand-alone or in a larger configuration—first consider how you’ll install and service it. Creating a solid plan that minimizes downtime for your client while still meeting objectives is a smart way forward. Through research, development and on-the-installation experience, Peerless-AV has created mounting systems for a variety of displays and applications, large and small. These resources will help you explore several mounting options and learn the most important differences between LED and LCD displays. Direct-view LED is growing in overall dollar share in the display installation market. 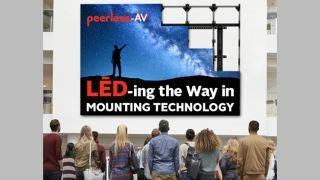 Now, Peerless-AV has developed mounting systems LED displays with a slim, space-saving profile and a pop-out design for easy installation and maintenance. Learn more here. Designed for 46-inch to 60-inch displays, the Supreme mount from Peerless-AV manages both portrait and landscape configurations with ease, and allows fine-tune adjustments without tools and single-hand pop-out serviceability. Read about it here. A lot of factors go into choosing the right display for an installation. Get a grip on the basics of the top display technologies in this blog, from brightness to pixel pitch and how it relates to viewing distance. When you’re up to speed, check out the on-demand webinar to discover six things you need to know about LED displays.